Crystal Lagoons, the multinational water innovation company and developer of the world’s top amenity, will be exhibiting for the first time at Cityscape Jeddah from 2-4 November, showcasing its patented technology that makes giant crystal clear lagoons a reality, while underscoring its portfolio of developments in Saudi Arabia and the wider Middle East. “Many developers throughout the region are looking for a point of difference and features such as Crystal Lagoons not only add to a developments aesthetic appeal, it provides practical leisure facilities as well as being more sustainable than a golf course. Essentially we offer a sound return on investment (ROI), because developers can charge a premium for properties overlooking or even in the proximity of our lagoons and in many instances help speed up the uptake of sales, by more than 70% in some instances,” said Carlos Salas, Regional Director, Middle East, Crystal Lagoons. “With its vast desert, mountains and dramatic coastline, the Kingdom has the potential to become one of the most exciting real estate markets in the world, especially after committing significant investment into major infrastructure projects right across the country,” he added. The new developments are expected to include residential units comprising apartments, villas and condominiums, a range of hotels, a business park, medical facilities, a range of universities and schools, an extensive retail offering and a cultural centre. “We have developed our patented technology and a proven business model to ultimately add significant value at a very low cost. Our ultrasonic filtration system means we use just 2% of the energy required by conventional filtration systems, half the water of a park of the same size and 30% less water than a golf course,” said Salas. “Our USPs have fast-tracked our growth and expansion and we’re now able to take our technology anywhere in the world, creating an idyllic lifestyle anywhere in the world. Furthermore, and looking to the future, we provide our partners in the Middle East, North Africa and India with a viable, affordable long term solution, despite climate and geographical challenges, particularly when you consider we can use any kind of water including brackish from underground aquifers, eliminating the need to use fresh water at all,” added Salas. Crystal Lagoons has also developed new film-based evaporation technology. The cutting-edge technology lowers water-waste rates by up to 70%, further enhancing Crystal Lagoons’ sustainable credentials. Exclusively manufactured in Canada for Crystal Lagoons, the technology consists of adding a special additive to the water which spreads an invisible anti-evaporation layer on the surface of the lagoon. This additive can be used at different water temperatures and withstand wind and rain. 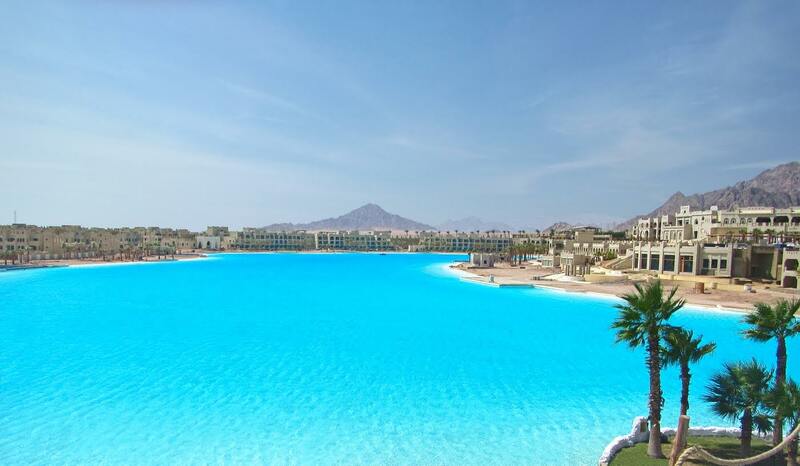 The company holds two Guinness World Records for the world’s largest lagoon, the first in San Alfonso del Mar, Chile and Sharm El Sheik, Egypt, which is the current world record holder at 12.2 hectares. Crystal Lagoons currently boasts over 400 projects, in various stages of development, in 60 countries worldwide. Crystal Lagoons will be exhibiting on Stand E15 at the Jeddah Centre for Forums & Events from the 2-4 November. The international market has confirmed the value of this technological innovation, with explosive growth that in less than seven years has reached a sizable portfolio of 300 projects worldwide in the urban, tourist, public and industrial sectors, in various stages of development. Today the company is associated with major international real estate companies, with presence in five continents across 60 countries, including the United States, Saudi Arabia, United Arab Emirates, Egypt, Thailand, Indonesia, Singapore, Jordan, Mexico, Brazil, Colombia, Argentina, Peru, Paraguay, Uruguay, Chile, among others. Patented in 160 countries, this technology is also revolutionising the international energy and water market via its industrial applications for sustainable cooling of thermal power and industrial plants, and low cost water desalination and purification. Crystal Lagoons is the only company in the world able to offer this innovative technology that enables the economically viable development of giant crystal clear lagoons suitable for swimming and the practice of water sports. These immense bodies of water are an irreplaceable amenity for real estate and tourist projects worldwide, as they add differentiated value and have caused a revolution in the worldwide real estate industry. These giant crystalline lagoons only require water to compensate for evaporation, and have a water consumption level of approximately half that of a park the same size and up to 30 times lower than a golf course. Conventional swimming pool technology requires high and permanent levels of residual chlorine or other disinfectants to be maintained in the water to provide permanent disinfection to the pool and avoid contamination of the water brought by external agents such as bathers. Crystal Lagoons’ solution is to apply disinfection pulses within the lagoon that do not require a high and permanent disinfection level, but only use controlled pulses of very small quantities of oxidants/micro-biocides applied according to specific algorithms on very specific patterns. The results of this efficient pulse-based disinfection system are that the overall amounts of additives consumed using Crystal Lagoons’ technology are up to 100 times less than the amount used for swimming pools. A typical lagoon has about 400 sensors/injectors for such purposes. Also, apart from the difference regarding water treatment and disinfection requirements as discussed previously, it must be noted that conventional swimming pool technology requires the filtration of its entire volume of water between 1 to 6 times per day (generally 4 times per day depending on regulations), which is achieved by using a traditionally configured centralized filtration unit. Crystal Lagoons’ solution is to apply a combination of different ultrasonic waves to the water in the lagoon, which allows the contaminant particles to agglomerate into larger particles that are easily removed from the system, consuming only 2% of the energy compared to conventional swimming pool centralized filtration systems.